Rose essential oil is a type of essential oil commonly used in aromatherapy. Sourced from the Rosa damascena plant, it contains the flower's aromatic compounds. Because these compounds are thought to possess healing properties, rose essential oil is used for a number of health-related purposes. According to aromatherapy practitioners, inhaling essential oil molecules, or absorbing essential oils through the skin, transmits messages to the limbic system — a brain region responsible for controlling emotions and influencing the nervous system. These messages are believed to affect biological factors such as heart rate, stress levels, blood pressure, breathing, and immune function. When applied directly to the skin, skin care products containing rose essential oil are purported to hydrate dry skin, clear acne, reduce signs of aging, minimize the appearance of scars, and help with conditions such as eczema and rosacea. In addition, rose essential oil is said to enhance libido, reduce stress, stimulate circulation, sharpen memory, and boost mood. Rose essential oil may help relieve stress, according to a 2009 study published in Natural Product Communications. For the study, 40 healthy volunteers absorbed either rose essential oil or a placebo through their skin. Results revealed that those who received rose essential oil experienced a greater increase in feelings of calm and relaxation, as well as a greater decrease in breathing rate and blood pressure, compared to those who received the placebo. A small study published in Complementary Therapies in Clinical Practice in 2014 indicates that rose essential oil may improve sleep quality in people hospitalized in coronary care units. In a trial involving 60 people, those who received routine care plus rose oil aromatherapy for three subsequent nights had a better quality of sleep compared to those who received routine care. Several preliminary studies suggest that rose essential oil may help alleviate anxiety. For example, a study published in Nephro-Urology Monthly in 2016 examined the use of aromatherapy with rose water for anxiety in hemodialysis patients and found that rose water noticeably reduced anxiety levels. 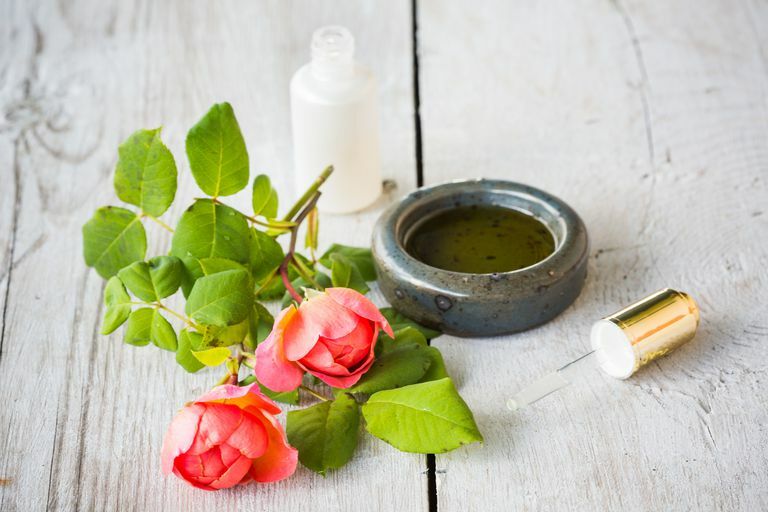 Rose essential oil may be of benefit to women undergoing menopause, suggests a 2008 study published in Evidence-Based Complementary and Alternative Medicine. For the study, researchers assigned 25 menopausal women to weekly massages with several essential oils, including lavender and jasmine essential oils, in addition to rose and rose geranium essential oils. After eight weeks, the study members who received massages reported a significantly greater improvement in menopausal symptoms (such as hot flashes) compared to the 27 study participants who weren't massaged. But the study authors were unable to attribute the positive effects to aromatherapy, massage, or the combination of the two therapies. When combined with lavender, cinnamon, and clove oils in a base of almond oil, rose essential oil used for abdominal massage may be effective in decreasing the severity of menstrual cramps. In a study published in Evidence-Based Complementary and Alternative Medicine in 2013, scientists found that women who had an abdominal massage once daily for seven days prior to menstruation using the oil blend experienced less pain (both intensity and duration) compared to the women who received a massage with almond oil alone. Another study, published in the Journal of Obstetrics and Gynecology in 2015, found that women who applied aromatherapy self-massage using rose oil had less menstrual pain by the second cycle compared to those who did self-massage with unscented almond oil or had no treatment. When combined with a carrier oil (such as jojoba, sweet almond, or avocado), rose essential oil can be applied directly to the skin or added to baths in very small amounts. Rose essential oil also can be inhaled after sprinkling a drop or two of the oil onto a cloth or tissue, or by using an aromatherapy diffuser or vaporizer. Essential oils are highly concentrated, so you should use caution when using them. Rose essential oil should not be taken internally. Essential oils should be diluted in a carrier oil before being applied to the skin and shouldn't be applied to the eyes or mucous membranes or used excessively (the oil is absorbed through skin and toxicity can occur if too much is applied). With any essential oil, there is the risk of contact sensitivity. A skin patch test is recommended prior to using any new essential oil. It's also important to note that self-treating a chronic condition (such as depression) with rose essential oil and avoiding or delaying standard care may have serious consequences. Pregnant and nursing women and children should consult their primary health care providers before using essential oils. You can learn more about how to use essential oils safely. Here are some tips on purchasing essential oils. Widely available for purchase online, rose essential oil is sold in many natural-foods stores and in stores specializing in self-care products. Barati F, Nasiri A, Akbari N, Sharifzadeh G. The Effect of Aromatherapy on Anxiety in Patients. Nephrourol Mon. 2016 Jul 31;8(5):e38347. Hongratanaworakit T. Relaxing effect of rose oil on humans. Nat Prod Commun. 2009 4(2):291-6. Hur MH, Yang YS, Lee MS. Aromatherapy massage affects menopausal symptoms in korean climacteric women: a pilot-controlled clinical trial. Evid Based Complement Alternat Med. 2008 5(3):325-8. Marzouk TM, El-Nemer AM, Baraka HN. The effect of aromatherapy abdominal massage on alleviating menstrual pain in nursing students: a prospective randomized cross-over study. Evid Based Complement Alternat Med. 2013;2013:742421. Nazıroğlu M, Kozlu S, Yorgancıgil E, Uğuz AC, Karakuş K. Rose oil (from Rosa × damascena Mill.) vapor attenuates depression-induced oxidative toxicity in rat brain. J Nat Med. 2013 Jan;67(1):152-8. doi: 10.1007/s11418-012-0666-7.